When You Need Emergency Roof Repair, You Can Depend on Armour Seal Roofing, Masonry and Contracting. Have you ever woken up in the middle of the night to drops of water falling on your face? Have you ever walked into a room and seen a puddle of water that wasn’t there hours before? These types of situations are stressful and inconvenient, especially when they are happening in the middle of the night. If you are dealing with residential roofing emergencies in Chester, PA, you can call on the roofers at Armour Seal Roofing, Masonry and Contracting. Since 1992, we have been providing homeowners with residential emergency roof repair. We understand that roof leaks or other unexpected damages can be scary, but you are in good hands with our roofing contractors. If you are in an emergency roof situation that requires help immediately, call our roofers today at 267-622-7158 for emergency roof repair in Chester, PA.
Signs You Might Need Emergency Roof Repair. While it does happen out of nowhere, there can be situations that cause residents to have emergency roof repair. Some of these situations include high winds, hail storms, and thunderstorms. 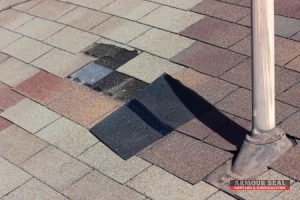 When these types of inclement weather happen, there are a few things that can happen to your roof. When homeowners are unaware that these things have happened to their roof or roofing components, it can result in emergency roofing repair. Fortunately, the roofers at Armour Seal Roofing, Masonry and Contracting are here for our residential customers when they need us the most, so if you need emergency roof repair in Chester, PA, call us today at 267-622-7158. Call Us Today for Emergency Roof Repair in Chester, PA. When you need emergency roofing repair, you can depend on the roofing contractors at Armour Seal Roofing, Masonry and Contracting. Our roofers will respond to your call immediately and show up equipped with the proper tools and materials to get the job done. While emergency repairs can be overwhelming, we are here to make the situation better with our high-quality roofing and customer service. With the help of our roofers, we can get your residential roof back in great shape. Call us today at 267-622-7158 if you need emergency roof repair in Chester, PA or want more information on our residential roofing services. Updated on October 2, 2017 at 9:38 pm by Armour Seal Roofing.